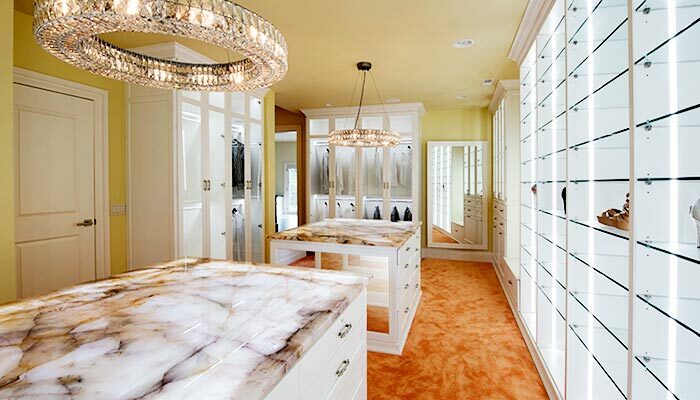 This palatial closet/dressing room will truly take your breath away. 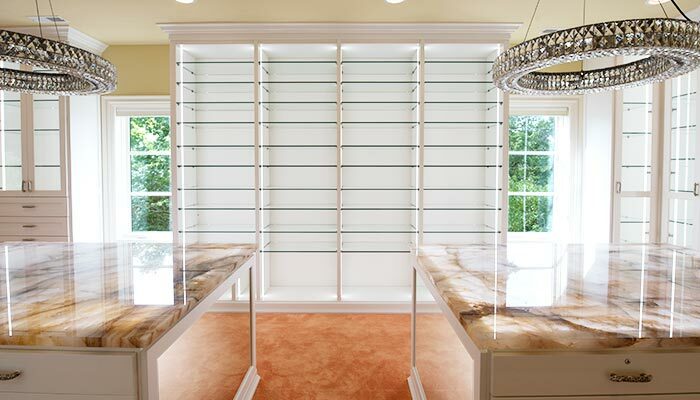 Featuring walls of glass shelves and glass cabinets with custom walk-in closet lighting options, it is a grand space offering a light, bright, airy and open feeling that inspires thoughts of the original Crystal Palace in London. 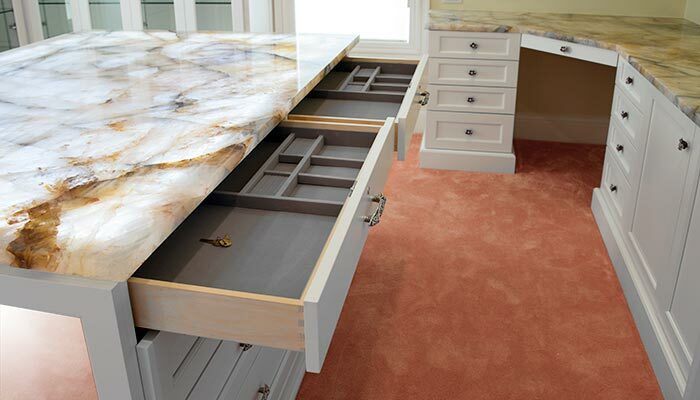 The footprint of this closet is slightly smaller than that 1851 great exhibition hall, but still offers an incredibly expanisive center section with two large closet islands. 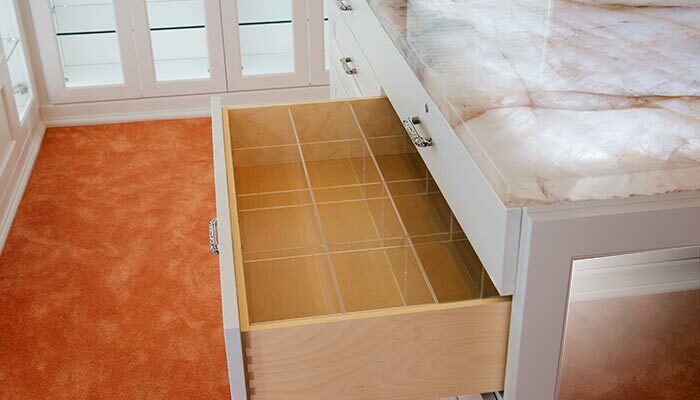 Each walk in closet island provides plenty of drawer space for lingerie and folded items. 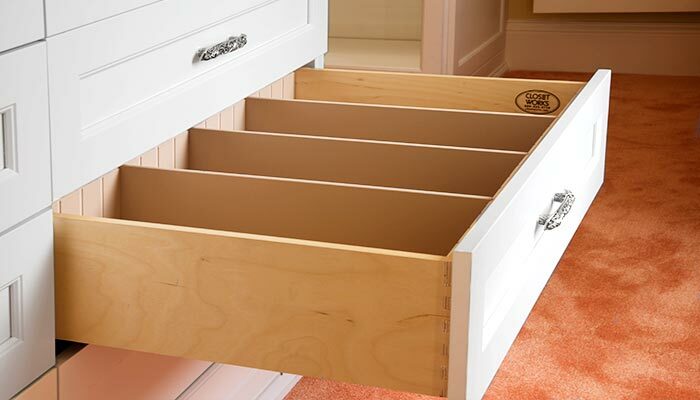 The drawers in the twin islands are furnished with custom closet organizers and drawer separators that offer ample storage in a neat and organized fashion. Mirrors were installed on the ends of each island, increasing the reflective light throughout the room — they're also perfect for checking your footware. 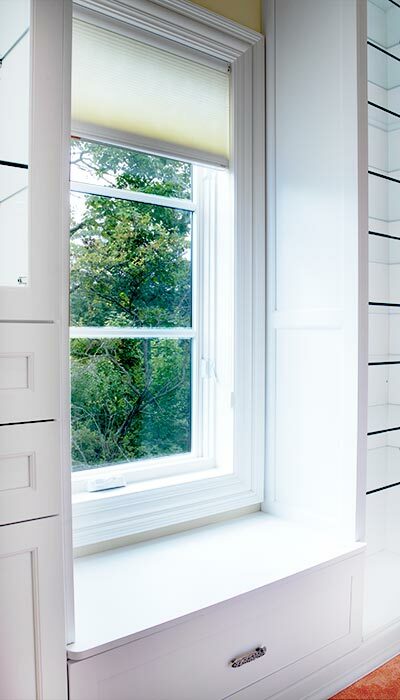 Wardrobe style closets with glass doors cover nearly three walls of the main walk-in closet space, keeping clothing for all occasions at hand with no worries about dust accummulating on evening gowns or less frequently worn items. All the wall closets with hanging rods are outfitted with LED walk-in closet lighting, making it easy to find that perfect outfit. Glass shoe shelves along one wall stand ready to organize an elaborate collection of purses and shoes. The shoe shelves are lit with vertical dressing room lighting and the total effect of focused light against all that glass creates a shoe organization system that could even make Cinderella envious. An additional corridor off this main section adds even more closet space. 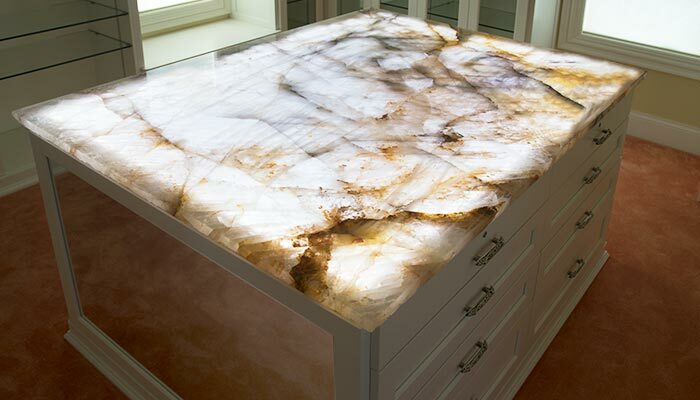 It is outfitted with floor to ceiling glass door cabinets — each with double hanging space. 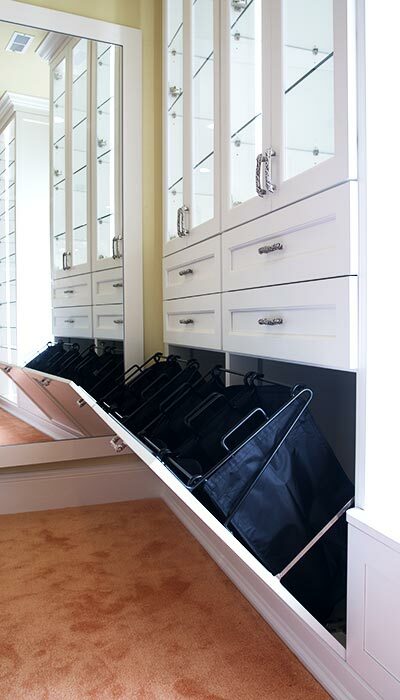 The upper racks of these 10 foot tall wardrobe closets are equipped with electronic pull down closet rods, allowing this double hang section to be long enough hold dresses that might traditionally be relegated to a smaller long hang section. 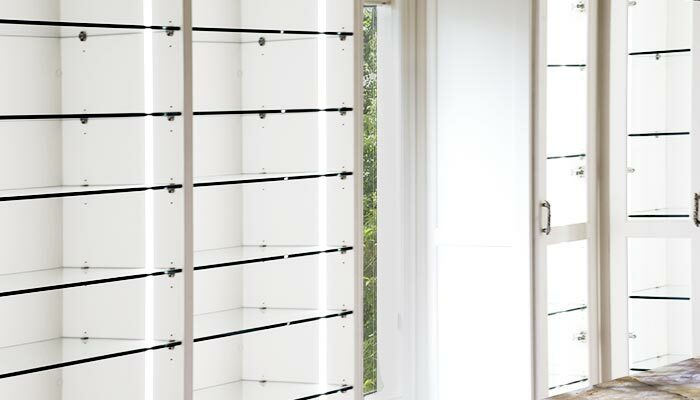 The electronic closet rods lower smoothly by remote control so that blouses and dresses can be browsed and selected from a comfortable eye level. 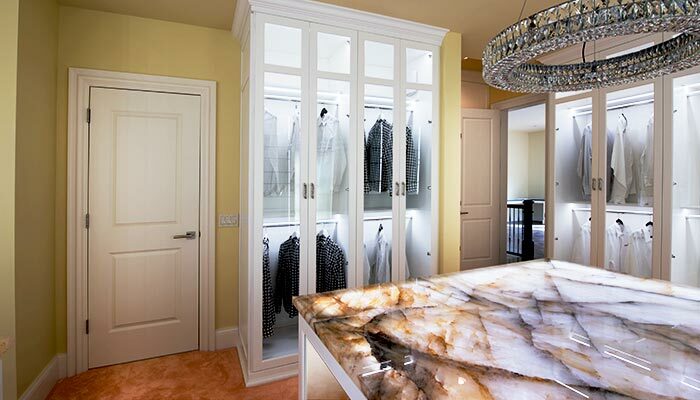 Master closet and dressing room for Her with glass cabinet doors and glass shoe shelves — all lit with an elaborate LED walk in closet lighting system that includes several backlit light panels for the transluscent stone countertop. Additional show stopping features of this closet inclide the electronic pull down rods in the wardrobe closets — bringing the upper level of hanging down to eye level to make it easy to browse and select clothing. 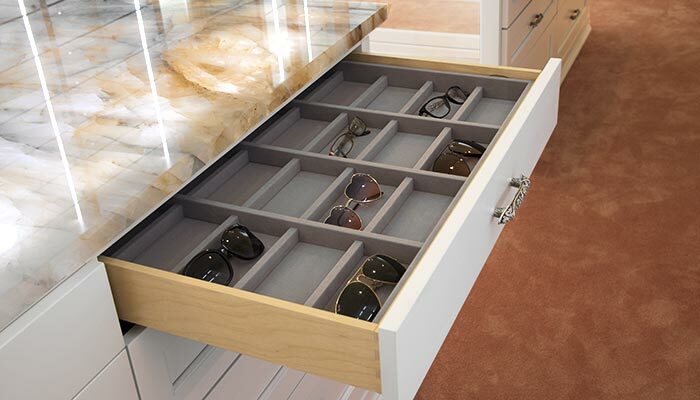 LED dressing room lights keep those closets bright and further enhance the ease of selecting shoes and clothing. 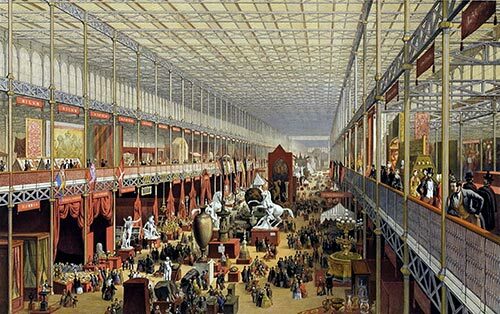 The size, light, glass and innovations in this closet inspire comparisons to London's renowned Crystal Palace Great Exhibition Hall and its revolutionary use of glass and light throughout the building.